Palm has added an entry-level model to its Treo family. 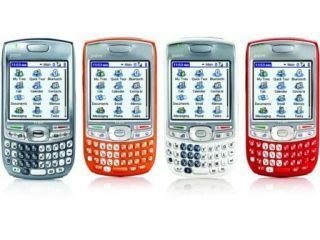 The Palm Treo 680 is slimmer than standard Treo handsets and comes in a range of different colours. Apart from the colour, there's not a lot of change from previous Palm models, such as the 750v. The Palm 680 is available in red, orange, white and silver. There is no set date for a European launch yet. Palm has also made the news this week as American news channel Fox News used a Palm handheld to deliver footage of the plane crash in New York on Wednesday. Fox News delivered early live video to its viewers from the site of the crash using a handheld Palm Treo smartphone with built-in video streaming capabilities. Scott Wilder, a cameraman for the network, ran about 20 blocks to the scene of the crash and reported live using his smartphone to transmit video to the Fox News control room, using the existing mobile network. Fox broadcast the video live on TV to supplement other video clips. Video clips from mobile phones isn't a new phenomenon in TV journalism - people caught up in the London bombings last year and the Boxing Day tsunami in 2004 captured footage with their phones, which was later broadcast on TV channels around the world. However, this was the first mobile phone video to be broadcast live on air. Documents To Go for viewing, editing and sharing Word and Excel documents.